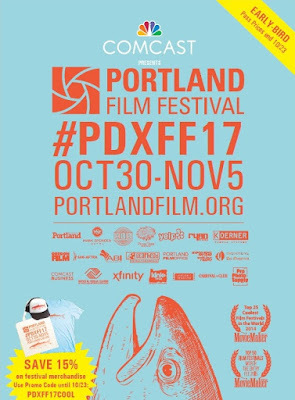 The 2017 Portland Film Festival has come and gone and, from everything I've seen, heard, and read, it was yet another smashing success! I am very happy to have once again had the opportunity to see a few of the films that were presented during the festival and have collected my reviews here for easy access. You will also find a list of films that took home awards from this year's festival as well as my own "Festival Favorite" pick for this year. The eight films pictured above are the ones I had the pleasure of watching during the festival and you can read my reviews for each one below. The Portland Film Festival staff always does a great job of selecting great movies and this year was no exception. The list below is alphabetical with my pick for the TwoOhSix Festival Favorite at the bottom. Secret Santa is a super fun holiday horror comedy that delivers a sleigh ride full laughs while unleashing a bloody battle between dysfunctional family members. Definitely worth checking out and should be added to your holiday movie play list. The 5th Annual Portland Film Festival announced the feature film and short film recipients of this year's awards in the Audience, Grand Jury and Director's Choice. Juries of leading industry experts and esteemed filmmakers determined Jury Awards for Feature Narrative, Feature Documentary, and Short Film categories. Feature Narrative: D-LOVE by Elena Beuca. Director's Choice Award: CRASH PAD by Kevin Tent. Awarded by the Executive Director of the Portland Film Festival, "for the film team that best embodies the creative, independent, and entrepreneurial spirit of the festival, as well as showing exceptional talent as artists." "This year's films were a huge success with audiences. We had larger crowds, more Q&A's and more directors in attendance than ever before," said Josh Leake, Founder and Executive Director of the Portland Film Festival. The fifth annual Portland Film Festival took place October 30 - November 5, 2017, at Portland's iconic Laurelhurst Theater, and included over 152 narrative and documentary films, educational panels & forums, and many events & industry networking opportunities.